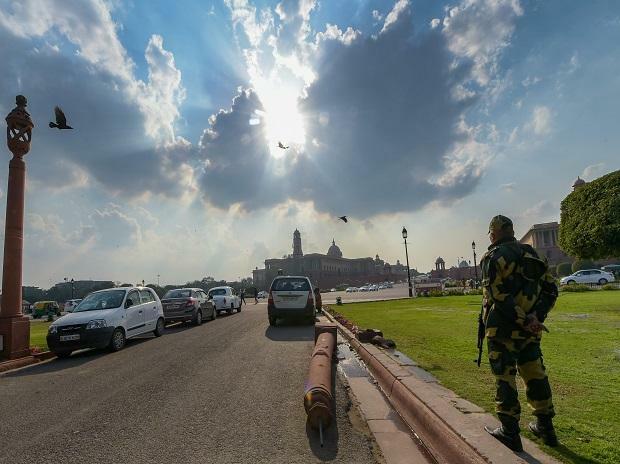 A security personnel stands guard at Vijay Chowk in the wake of rising tension between India and Pakistan, in New Delhi, Wednesday, Feb 27, 2019. Top US lawmakers have said that the escalating tension between Pakistan and India is "deeply alarming" and asked the two nuclear-armed countries to settle their differences through negotiations and not war. Democratic presidential aspirant Tulsi Gabbard said, To our friends in India and Pakistan: As nuclear powers, please remember it's your responsibility to the global community to settle differences through negotiations not war. In times like this, cool heads must prevail." The world is praying you will have the courage to work for peace, said Gabbard, the first Hindu elected to US Congress and a four-time Democratic lawmaker. Gabbard till this January was Co-Chair of the Congressional Caucus for India and Indian Americans. Congressman Brad Sherman, Chairman of House Foreign Affairs Sub-committee on Asia, the Pacific, and Nonproliferation hoped that the two countries will exercise maximum restraint. We all hope that India and Pakistan will exercise maximum restraint during the current crisis. Diplomacy is the only path to resolve this conflict, he said. Senator Ed Markey said the heightening tensions between Pakistan and India are "deeply alarming". These two nuclear-armed states must commit to resolving this crisis peacefully, and the US should stand ready to assist. We must not allow conventional tensions to go nuclear, Markey said. Senator Chris Murphy, Ranking Member of the US Senate Foreign Relations Subcommittee on Near East, South Asia, Central Asia, and Counterterrorism, urged the India and Pakistan to convene emergency high-level talks to de-escalate tensions between them. Neither India nor Pakistan can allow this situation to escalate, and I strongly urge both countries to engage in talks and avoid any further military provocation, Murphy said. "The US should not abdicate our diplomatic role here, either. President Trump should quickly nominate a qualified ambassador to Pakistan who can help diffuse tensions, said Murphy. Following the Pulwama terror attack in which 40 CRPF soldiers were killed, India bombed and destroyed JeM's biggest training camp in Balakot in Pakistan's restive Khyber Pakhtunkhwa province, about 80-km from the Line of Control (LoC) early Tuesday, killing a "very large number" of terrorists, trainers and senior commanders. On Wednesday, Pakistan claimed shot down two Indian fighter jets over Pakistani air space and arrested a pilot. Prime Minister Imran Khan tried to defuse the tension by saying war is futile and can lead to unknown consequences while making an oblique reference to the nuclear weapons that both countries possess. Some prominent American observers on South-Asian affairs said Wednesday that Pakistan needs to dismantle terrorist groups and end its support to such organisations to de-escalate tensions with India. They warned that the absence of Pakistan taking such an action can spark an "unforeseen war". "Pakistan Prime Minister Khan is absolutely correct when he says All wars are miscalculated, and no one knows where they lead to. And this is why Pakistan should dismantle every terrorist group in the country. They can spark an unforeseen war, Bill Roggio, editor of Long War Journal said. India and even the US had evidence of Lashkar-e-Taiba's involvement in the 2008 Mumbai attacks. Pakistan has of course done nothing to dismantle its pet terrorist group. LeT thrives in Pakistan to this day, he said. Jeff M Smith from the Heritage Foundation disagreed with the view that the Pakistani retaliation made India look weak. Don't agree with view that recent events make India look "weak." Airstrike was a more robust response to the Pulwama attack than anyone anticipated, he tweeted. What the US and international community has and hasn't said speaks volumes about India's support. And Pakistan's clearly trying to de-escalate, Smith said. Lecturing India on how to defend it's national security is counterproductive. Do I hope Delhi shows restraint? Yes. Even more so, I hope the world recognises if it wants restraint from India it needs a more credible plan for dismantling terror factories. Or we'll be back here soon, Smith said as he supported India's stand that Pakistan needs to act against terrorists. Ronak D Desai, India Practice vice chair at a prominent international law firm and expert at the Lakshmi Mittal South Asia Institute at Harvard University, said the US can create strategic space for India to de-escalate the ongoing crisis. Only the US can create this space by recognising India's legitimate concerns and applying pressure on Pakistan to not just release Wing Commander Abhinandan, but to also dismantle terror networks operating with impunity in the country, he said. Private DefCon Warning System, that monitors nuclear threat level for the US, said that while there are currently no imminent nuclear threats against the US at this time, however, the escalation of India-Pakistan conflict requires closer monitoring. Reports from all sources we monitor indicate deterioration of the situation between India and Pakistan. Reports of civilian evacuations, constant military activity and movement, maximum alert levels on both sides, closing of airspace - all point to a growing intense crisis, DefCON Warning System said.